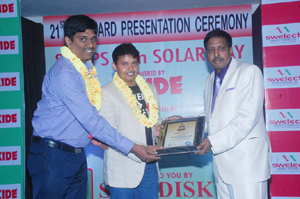 R Chellappan : MD, Swelect Mr. Sunil Rathi : President Marketing, Vikram Solar Mr. Krishna Revankar, CEO, Emmvee. 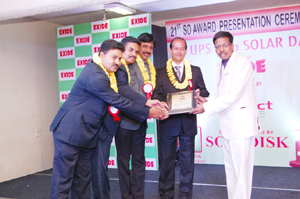 Numeric HPE 33, HPE i 33 & HP FS 33 of 3 Phase & HPE, HP Series of Single Phase Online UPS Systems & the line interactive UPSs have been adjudged best in Product quality & After Sales Service in SD’s Users’ Satisfaction Survey 2013. 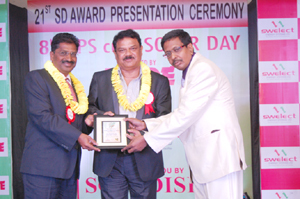 Mr. A Balan, Director & Mr. K V Nachiappan, Director, Numeric UPS & his team. 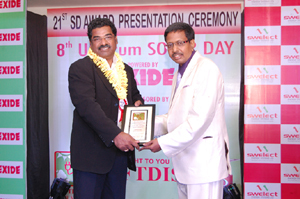 SD’s USERS’ Satisfaction Survey, 2013.
to Mr. A Gopal, General Manager Hitachi HI-REL . 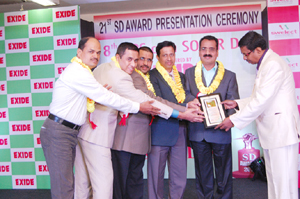 SD Users’ Satisfaction Survey, 2013. 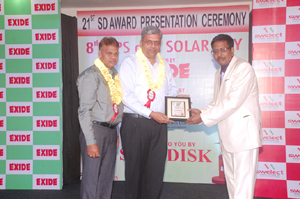 Delta’s Ultron DPS Plus Series adjudged best in 3 Phase to 3 Phase UPS System in 60 to 200 kVA Category. 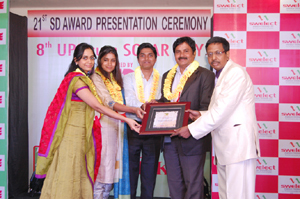 Amplon RT range of UPS System adjudged best in Single Phase UPS Systems below 10 kVA Delta products have earned A++ ratings satisfaction level in SD Users’ Satisfaction Survey, 2013. 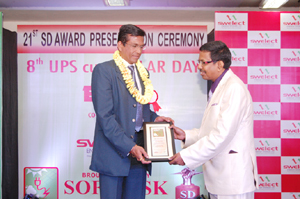 Uniline has been adjudged Best in terms of After Sales Service & Best in technology Advantage vis-a-vis Cost Effectiveness for Single phase online UPS Systems in SD’s USERS’ Satisfaction Survey, 2013.
to Mr. K K Jain,CEO, Uniline. 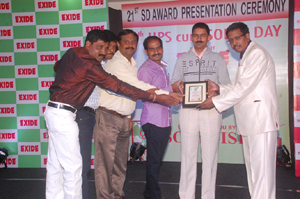 TECH UPS brand of online UPS System has been voted best in terms of product quality for three phase 10 to 60 kVA Catagory in SD USERS’ Satisfaction Survey, 2013.
to Mr. Narayan Sabhahit, MD, & his team. 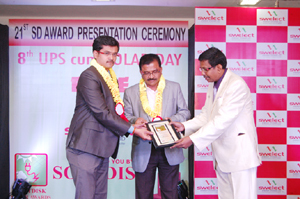 Powerone’s Three Phase UPS System has been voted as best in terms of technology advantage vis-vis cost effectiveness. 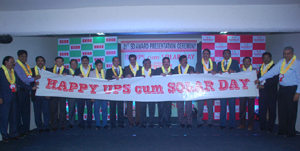 The company registered 94% Satisfaction level with A++ rating in Online UPS Systems for its entire range in User Satisfaction Survey 2013.
to Mr. 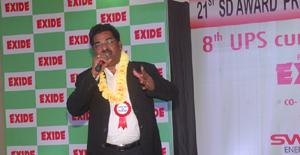 I B Rao & M R Rajesh, Director, Powerone & his team. 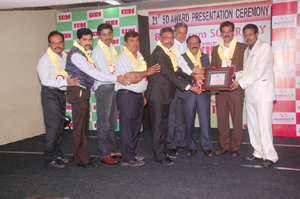 HYKON’s - GETT 10 - GETT 50 Online IGBT Three Phase has been adjudged best in terms of Product Quality. 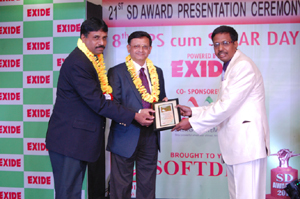 The company has secured 91.5% satisfaction level in SD Users’ Satisfaction Survey, 2013. Zoom View SD’s No. 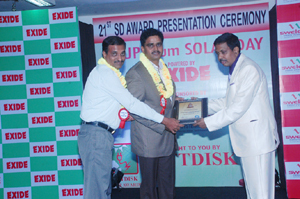 1 (Home UPS-Inverter) Company of the Year. 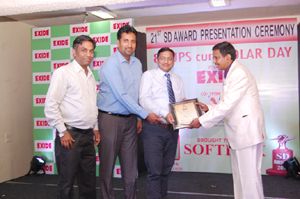 Microtek has been adjudged best in After Sales Service for all types of UPSs having A++ satisfaction ratings in SD’s USERS’ Satisfaction Survey, 2013.
to Mr. Nirvikar Sharma, ZSM, Microtek International Pvt. 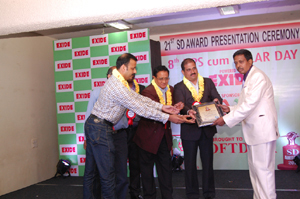 Ltd. & his team. 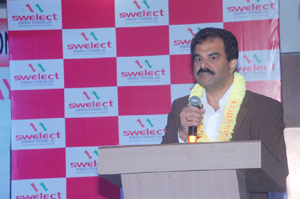 Elent brand of offline UPS had the distinction of having been adjudged Best in Technology Advantage vis-à-vis Cost-Effectiveness in SD’s Users’ Satisfaction survey 2013.
to Mr. Ashish Puri, Elent Electronics Pvt. 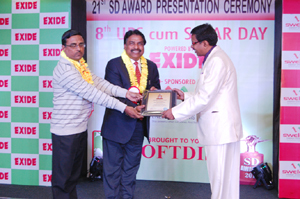 Ltd.
SD’s No. 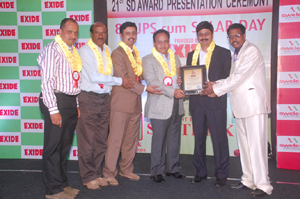 3 Offline / Line Interactive UPS Company of the Year. 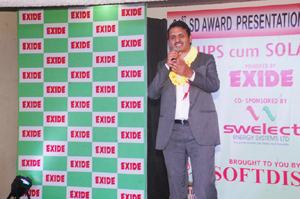 600 VA –120 KVA brand of line-interactive UPS Systems have been voted best in terms Product Quality in SD’s Users’ Satisfaction survey, 2013.
to Mr. Ramdin Sanga Saiwei,Business Head, WeP. 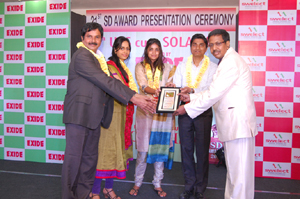 NEOWATT ENERGY SOLUTIONS COMPANY PVT. LTD, BANGALORE. 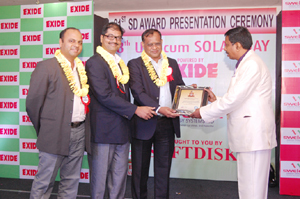 Zoom View Adjudged SD’s Fast Growing Power Electronic Company. 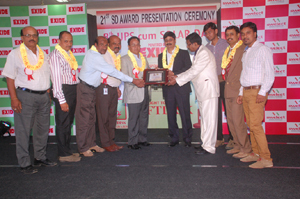 Adjudged being best in Product Quality of UPS & Inverters in Users Satisfaction Survey, 2013. Awarded A++ rating in this years survey. 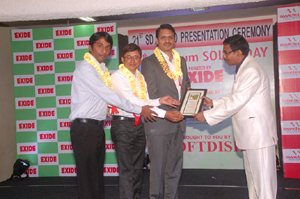 to Mr. Shivaji Waghmare, MD, Neowatt Energy Solutions Co. Pvt. Ltd., & his team. 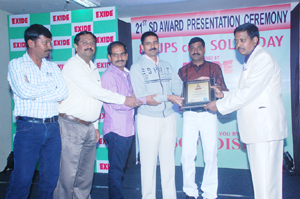 Zoom View ARVI’s FL-ECT 303, EC-303 were adjudged best in product quality, Innovation & Energy Efficiency for the INDUSTRIAL UPS range 60 to 200kVA. 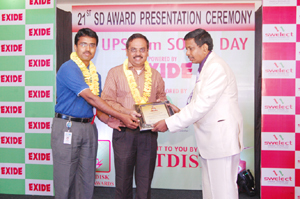 The company registered 94% satisfaction level with “A++” ratings in Online UPS Systems for its entire range in SD USERS’ Satisfaction Survey, 2013. 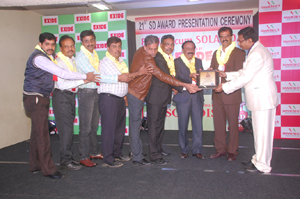 Zoom View Eaton 9395 has been adjudged best in product quality in above 200kVA range with 94% satisfaction level with “A++” ratings in Online UPS Systems for its entire range in USERS’ Satisfaction Survey, 2013.
to Mr. A S Ravishankar,Director South & East, Eaton & his team. 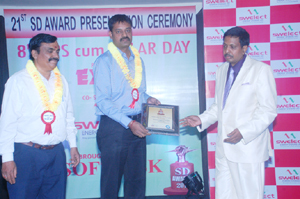 Zoom View E&C registered 94% satisfaction level with “A++” ratings in Online UPS Systems for its entire range in USERS’ Satisfaction Survey, 2013.
to Mr. N Sridhar & Ganesh of E & C.
Zoom View POWERNET registered 94% satisfaction level with “A++” ratings in Online UPS Systems for its entire range in USERS’ Satisfaction Survey, 2013.
to Mr. Sumanth Kumar, Director, Powernet Solutions Pvt. 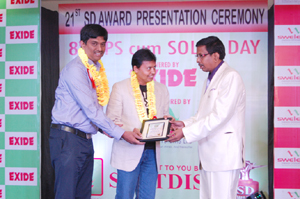 Ltd. & his team. 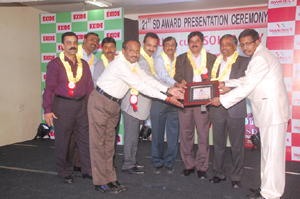 Zoom View Total Power Conditioners registered 94% satisfaction level with “A++” ratings in Online UPS Systems for its entire range in USERS’ Satisfaction Survey, 2013.
to Mr. Y B Suresh & B S Swamy, Directors, Total Power Conditioners Pvt. 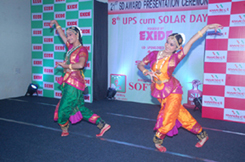 Ltd..
Zoom View Powertronix registered 93% satisfaction level with “A++” ratings in Online UPS Systems for its entire range in USERS’ Satisfaction Survey, 2013. 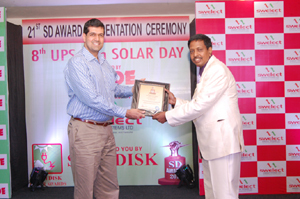 Zoom View Cosmic registered 94% satisfaction level with “A++” ratings in Online UPS Systems for its entire range in USERS’ Satisfaction Survey, 2013.
to Mr. Sunil Rathi, President Marketing, Vikram Solar Pvt. 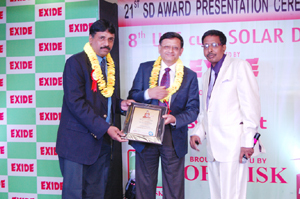 Ltd. & his team. 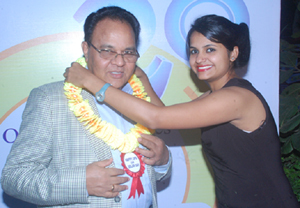 to Mr. Dinesh Jain, Exe. 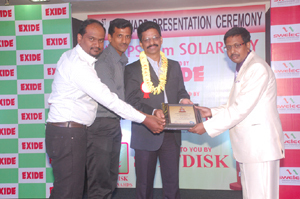 Director, Microsun Solar Tech Pvt. 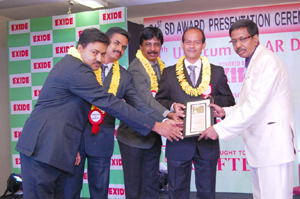 Ltd. & his team. to Mr. 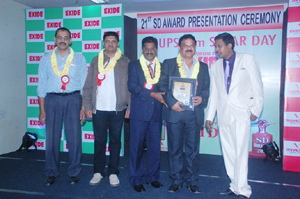 I B Rao & Mr. Rajesh M R, Directors Power one & their team. 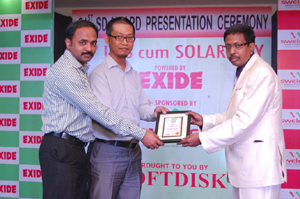 to Mr. K L H Raya, MD, Deepa Solar Lighting Systems Limited. 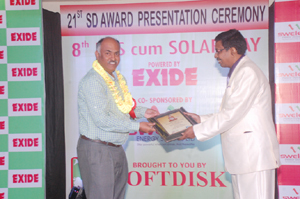 The company secured Softdisk A++ Green Star Rating for the year 2013.
to Mr. Ramdin Sanga Saiwai & his team. 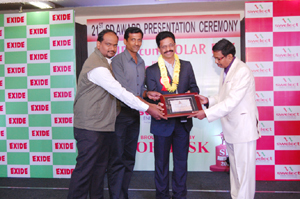 to Mr. Y B Suresh & Mr. B S Swamy, Director, Total Power Controls Pvt. 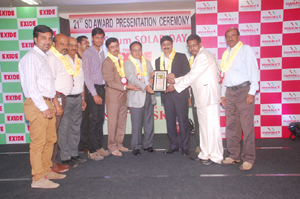 Ltd.
for Product & Customer Service Leadership in Finance & Rural Cooperatives Vertical. 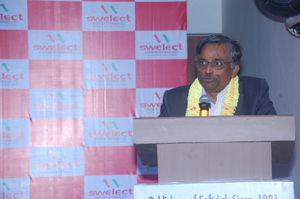 Service Leadership in SME Vertical & are also the SD No. 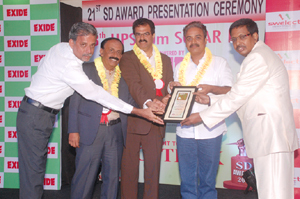 1 SPCU Manufacturer in the Country. 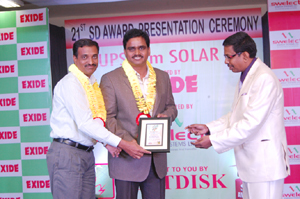 DELTA ENERGY SYSTEMS PVT. 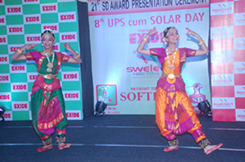 LTD.
Zoom View MODULON DPH Series, 25 - 800 kW from DELTA POWER SOLUTIONS (INDIA) PVT. 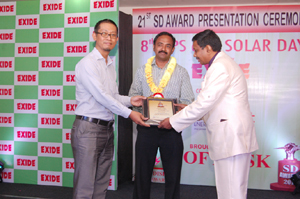 LTD.
to Mr. Ajit Mahapatro, Head (South India Operations) & his team. 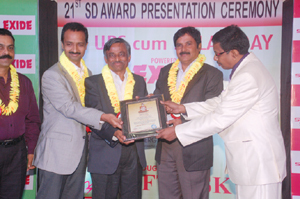 Best practices In UPS Industry for Achieving Superior Performance & Outstanding Achievement. 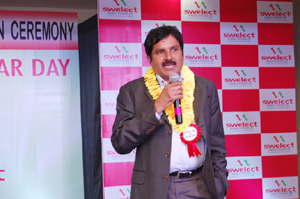 Mr. K V Nachiappan, Dir. Marketing & their team. 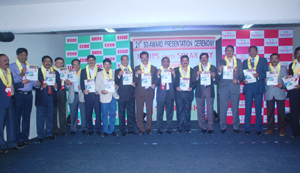 largest numbers of Roof Top Installation in the country in 2012 -2013.